We received many greeting cards from our clients this year as well. 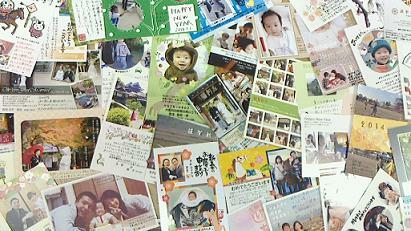 We were very happy to find many cards with photos of the wedding ceremony, the honeymoon trip or the smiles of children. And we could find lots of messages like “I’ll be mom in spring” “We’ve got the second child” “We enjoyed our honeymoon trip to Hawaii” “We went to Mauritius island in the Indian Ocean”. Thanks to these happy messages, we made a good start of the new year. We are very happy that we’ve had so many people coming to our Kyoto & Tokyo office today for the consultation of the wedding plan. At LST, we promise our best effort to offer “a very unique wedding plan for each couple” so that our clients and their guests can enjoy the very special day. We hope to serve you soon.